If you’ve ventured off the beaten path in Amador County, you’ve no doubt found Sutter Creek, a charming wine village with the rich history of California’s Gold Rush. But nobody has been rushing to Sutter Creek for its restaurants. A quiet newcomer to the Amador restaurant landscape looks fabulous and sounds delicious but only serves breakfast and the last time we visited they refused to serve us just ten minutes after closing time: 11:00 AM. But, the menu looked much more interesting that any other restaurant in Sutter Creek. So, more on that later. Currently, the best place to eat in Sutter Creek is Taste, which is actually in Plymouth. Well worth the 15 or so minute drive from Sutter Creek, Taste has creatively tasty delectables for those with a gourmet palate or simple wine country visitors who want to be wowed. 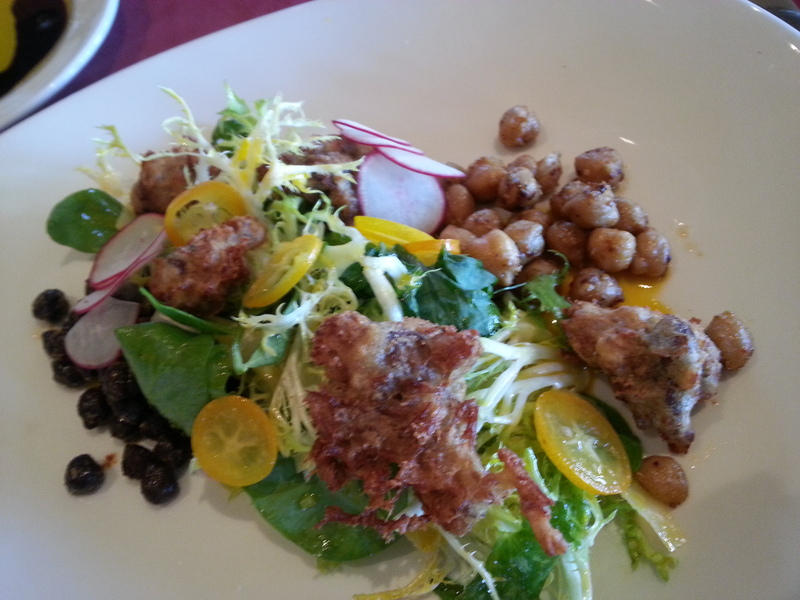 A seemingly simple salad had amazing layers of flavor from fried chickpeas and tangy kumquats. 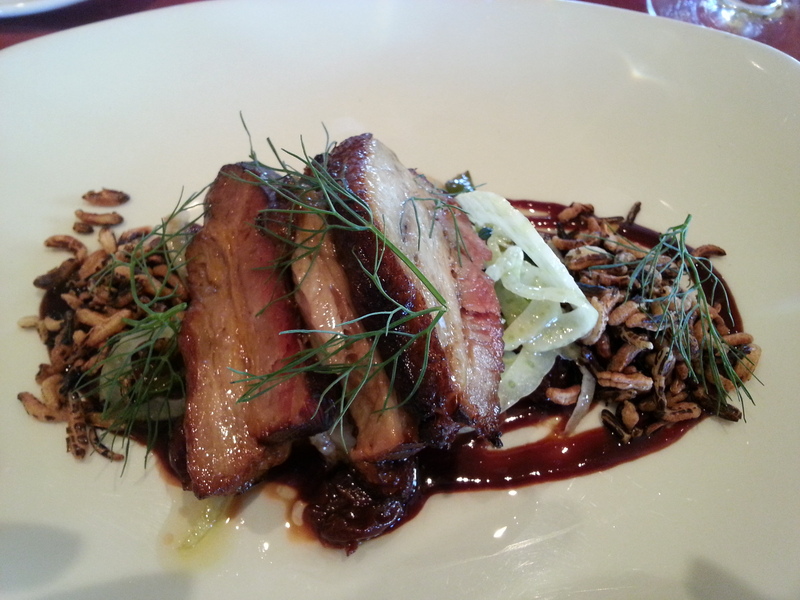 Next a pork belly had a slightly crisp outer texture with tender salty meat on the inside with lively flavor from fennel. The Mushroom Cigars were highly recommended by locals. Will def be back to try them! The charming gold rush town of Sutter Creek is going through a re-birth. With delicious tasting rooms opening along Main Street, plenty of places to stay, and restaurants going through renovations, it’s time to return and give this town another look. Gold Hill California Champagne – a nice crisp sparkling with a hint of sweetness but not too much. Le Mulet Rouge Almond Sparkling Wine – nuts are a flavorful pairing for sparklers so why not get them all blended together. This slightly sweet sparkler is great for appetizers, cheese, or as a dessert wine. Gold Hill Malbec – dark ash and berry with hints of plum and blueberry dominate giving it a ripe luscious mouthfeel. We love this high alcohol wine for after dinner. Gold Hill Merlot – probably one of our favorite Merlots. Lively bright cherry without overwhelming acidity dominates this wines body. Light tannins and a log lasting finish keep it real. Gold Hill Barbera – this area is known for Barbera and theirs has tart bright red cherry fragrance with a big wide body full of flavors. Gold Hilll Cabernet Sauvignon – with a cherry cola fruit palate, this wine is balanced by bright vibrant acidity and strong tannins. Gold Hill Petite Sirah – this wine has a smooth slightly spice box melange of blueberry pie with a dark dank smoky quality that gets more and more prevalent as you swirl. PS, I love you!